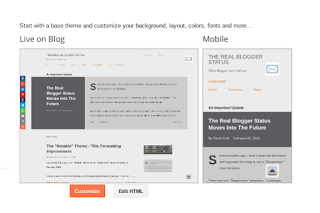 The exciting, new "Responsive" themes are a move forward, for Blogger. Like every move forward, though, there's always a couple steps backwards. 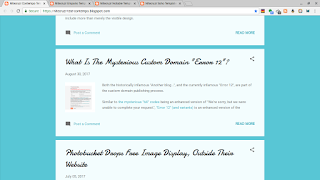 The "Responsive" themes are not as easily customised as the earlier "Designer" and "Layout" themes - and they lack some enjoyable features. 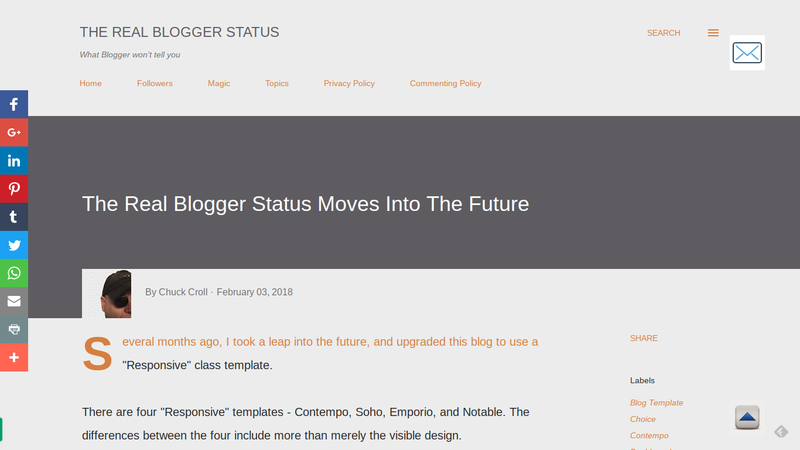 This blog, using the "Notable" template in the "Responsive" themes class, is better looking and easier to read - but there are features lacking. Besides lacking customability, there are various features in previous themes classes, that you won't find any more. Jump Break is not available. The "Responsive" class themes do not provide for a configurable, per post "teaser" section aka "Jump Break". The main page for "Contempo" and "Notable" has a "teaser" - but it's not configurable. The main page for "Emporio" and "Soho" will show only the first image in the post - and no text. The new home page, for this blog. 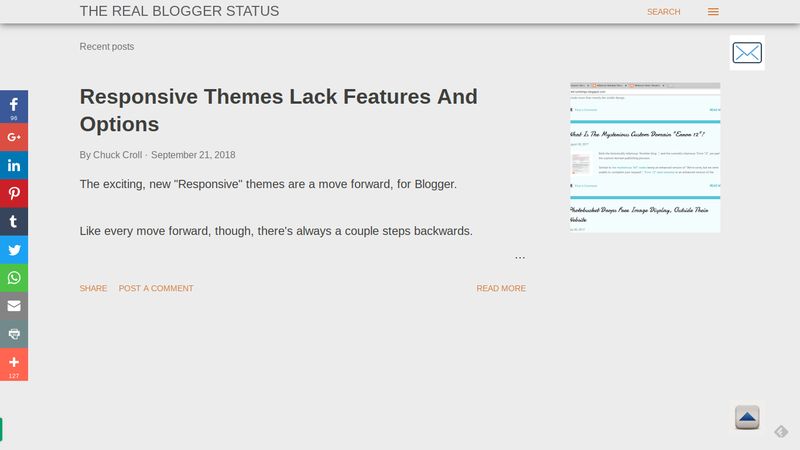 The main page for my demo blog using the "Contempo" theme. The "teaser" can't be adjusted. The main page for my demo blog using the "Emporio" theme. The "teaser" is simply the first image, in each post. 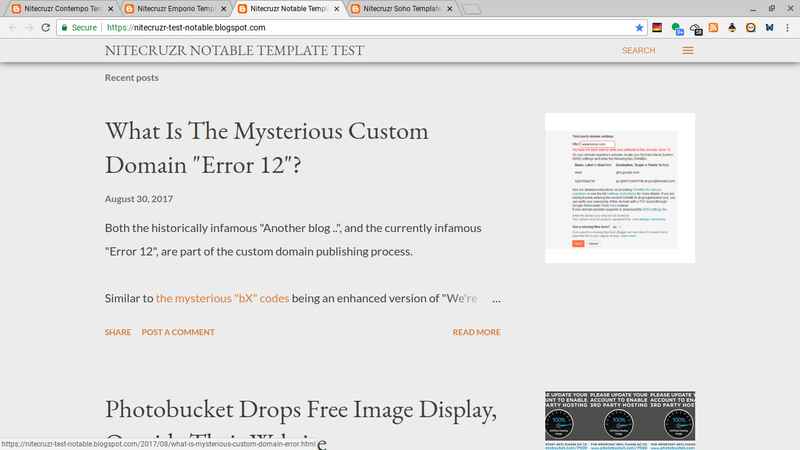 The main page for my demo blog using the "Notable" theme. The "teaser" can't be adjusted. The main page for my demo blog using the "Soho" theme. The "teaser" is simply the first image, in each post. 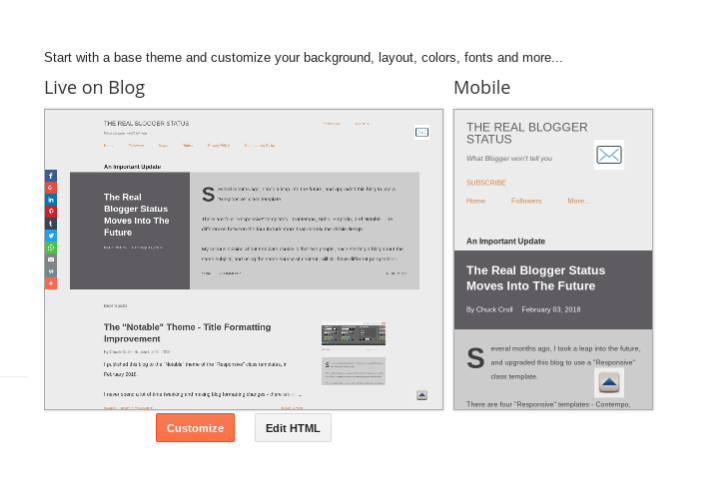 With a blog using any one of the "Responsive" themes, the main page "teaser" is not configurable. The "mobile" template is not available. One of the problems with the "mobile" template was that there was only one mobile template. Some "mobile" computers would do better displaying the regular "desktop" template, than the one "mobile" template. 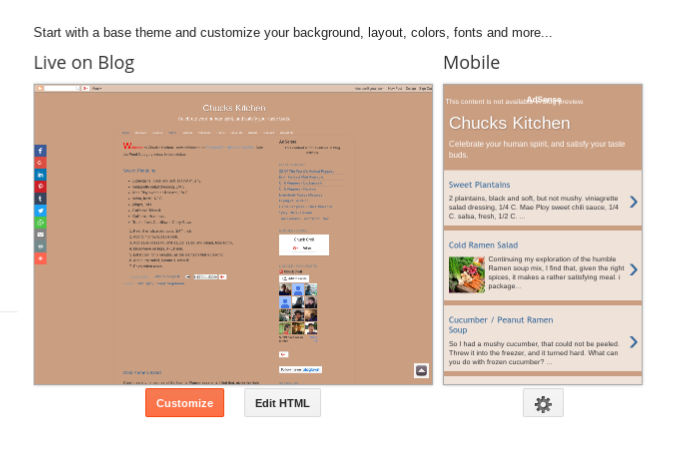 And the "mobile" template was not included in the template "Edit HTML" wizard. Some CSS could be used - if you knew what tags to update. The dashboard "Theme" page, for my "Kitchen" blog, that uses "Picture Window". See the "cog wheel" icon, under "Mobile"? The dashboard "Theme" page, for this blog, that uses "Notable". Where's the "cog wheel" icon? Now, there is only one template - and no "Mobile cog wheel". Instead of a "mobile" template, the "Responsive" theme code automatically adjusts the display, depending upon screen size. A "mobile" display is automatic - and some features are suppressed, for smaller screens. It's possible that the navbar contains details that are not compatible with hosting on the Google CDN. 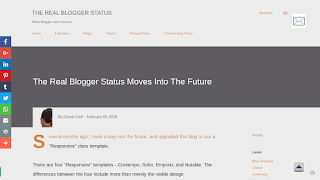 Is this why Blogger started providing a "Report this blog" sidebar gadget - to replace that one navbar link? The sidebar is now hidden - unless you need to see it. See the linklist "Responsive Templates Tests", in the pop out sidebar? You need to click on the "hamburger" icon, in the upper right corner of the screen, to see the sidebar. 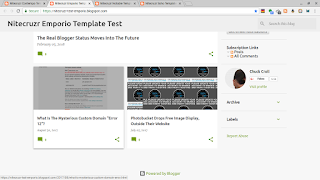 The "pop out" sidebar is one innovative design feature, that helps the "Responsive" class templates replace the "Layout" / "Designer" class templates, and their special "Mobile" template. 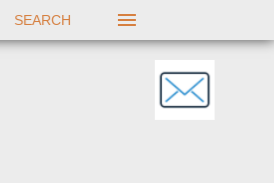 The "hamburger" icon, in the upper right corner, is used to summon the sidebar - when needed. The pop out sidebar is only visible, when you want to access sidebar content, by clicking on the "hamburger" icon. There are more, undocumented improvements, too. 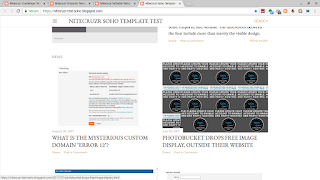 There are various significant differences between the four different "Responsive" templates, that may encourage choice of one or the other. I'll update this post, from time to time. Every new #Blogger feature or option offers excitement - and every new feature or option offers regret. The exciting new "Responsive" class themes are no exception to this rule. 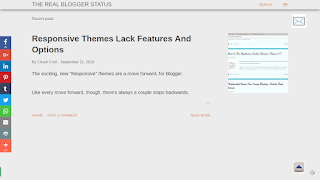 We miss several features, found in previous Themes.